Here are some fresh and easy ideas for decorating with pumpkins this fall! 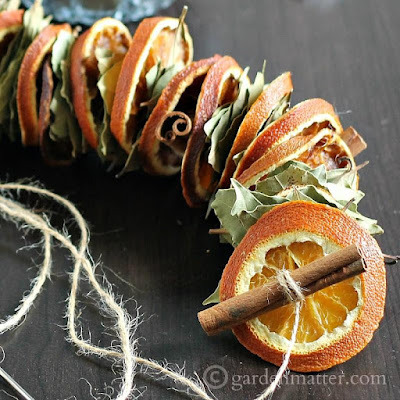 This first idea is a kitchen centerpiece from Ella Claire Inspired and there are lots of other great ideas at that site! 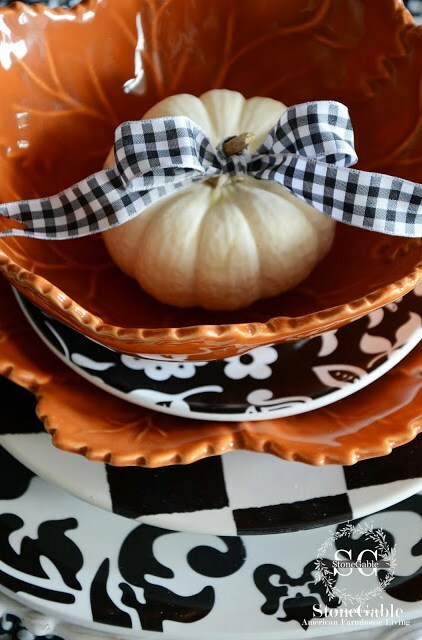 A fun fall tables cape with a mix of patterns and autumn color. This is from Stone Gable. 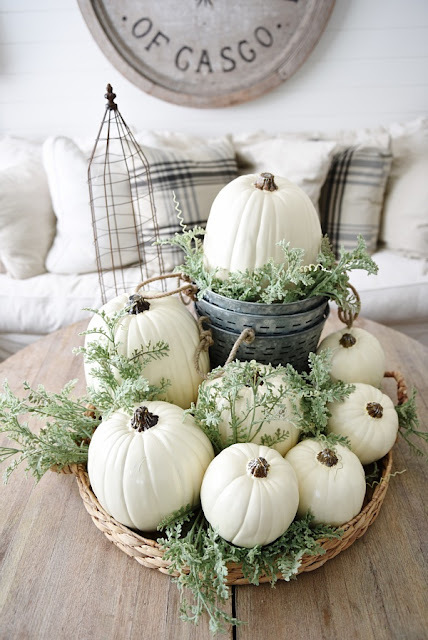 Create a neutral autumn centerpiece for your living room coffee table-the greenery adds to the freshness of this display! From Liz Marie Blog. 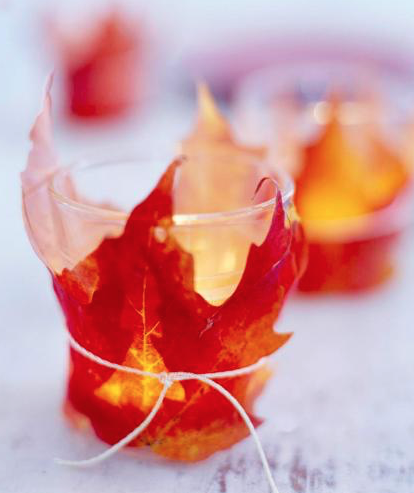 Add a little candlelight with autumn votives. From Midwest Living. 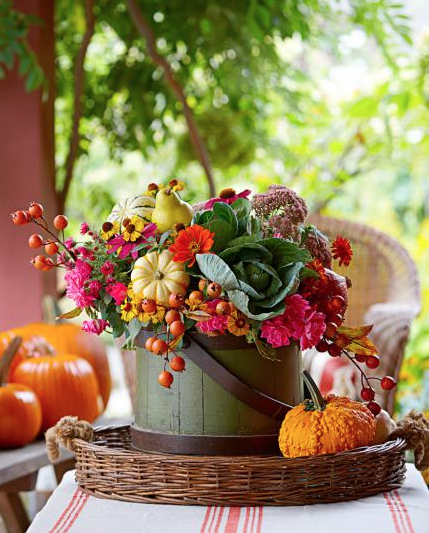 Outside, display seasonal flowers and plants in rustic wooden or metal containers. Also from Midwest Living. 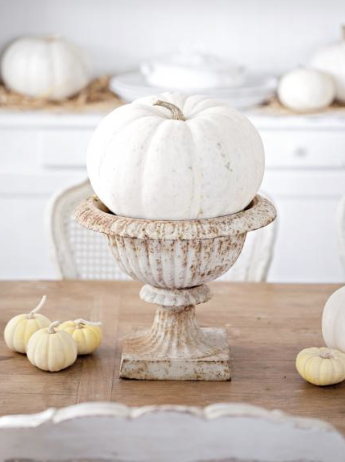 Can you use any of these ideas in your home this fall? In honor of the first day of spring, I had to post about this lovely color combination I've noticed the last few weeks. 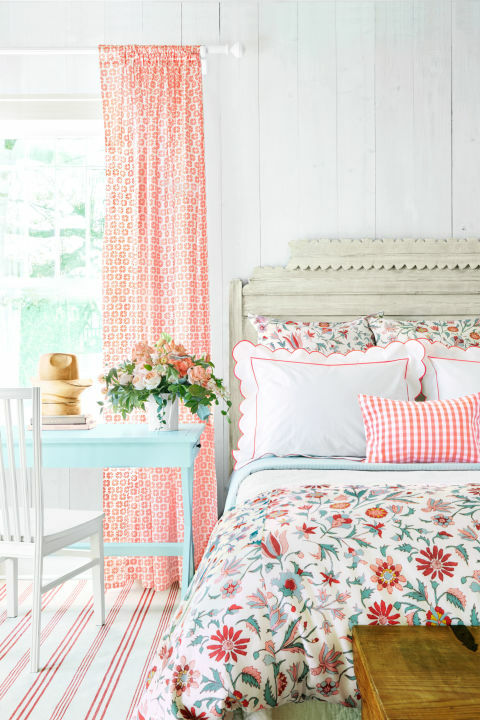 Teal and peach look so fresh together in the photo above from Country Living. 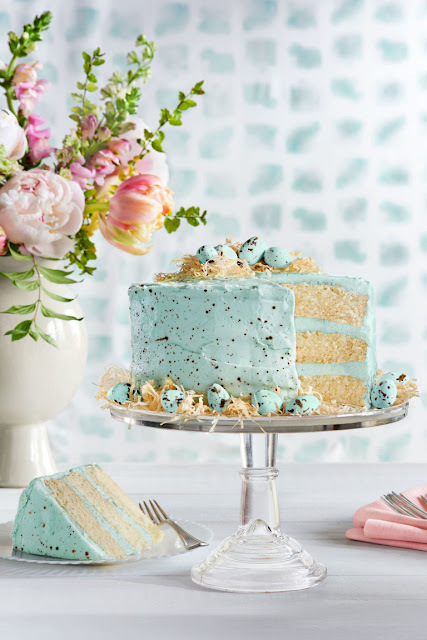 Here's another Country Living photo with teal and peach hues, featuring pretty flowers and a wonderful spring cake! 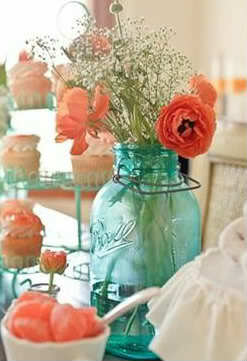 Peachy flowers in a vintage teal canning jar...beautiful! From The Perfect Palette. 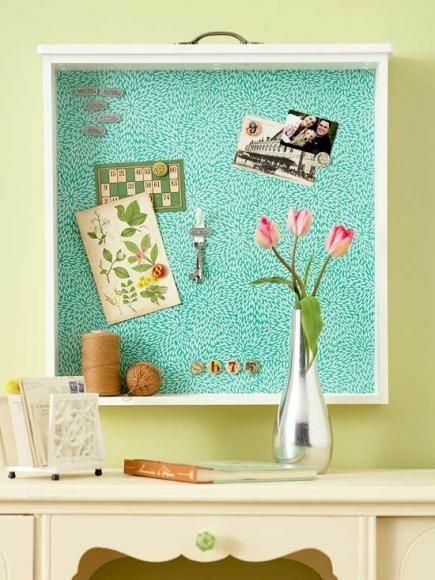 Add some teal accents with a unique bulletin board, made from an old drawer lined with cork board and covered with pretty paper. A great way to upcycle! From Midwest Living. Are you using peach and teal in your home to decorate this spring? 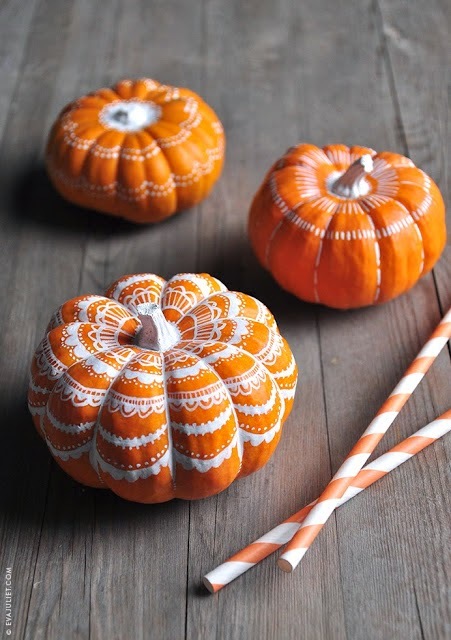 Have you decorated any pumpkins yet? 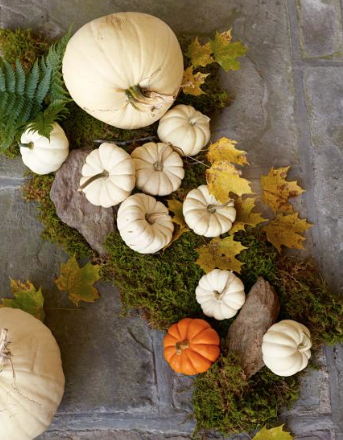 Here are some ideas that will add a pretty touch wherever you place your pumpkins–whether it's a display on your porch or inside your home...or both! 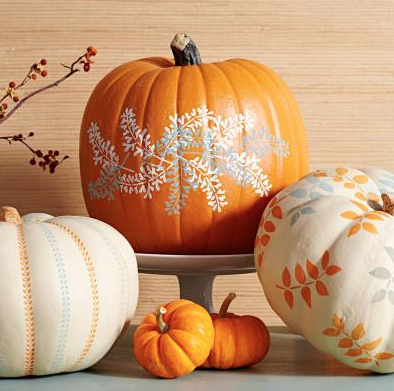 Paint simple patterns on pumpkins–pure white looks great against the bright orange. Photo from Mon Carnet. Or paint lacy patterns in black–doilies are used as stencils to get this look! 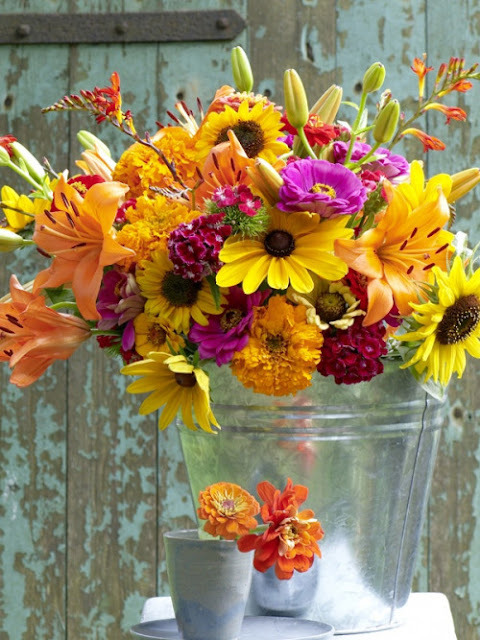 From Midwest Living. 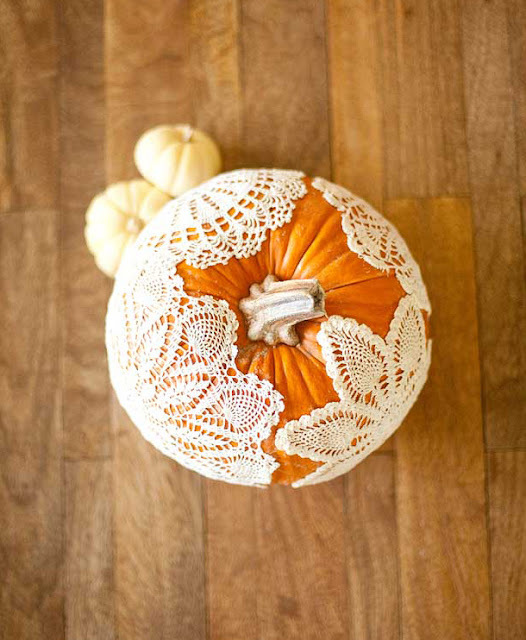 Love this pumpkin that is actually decorated with real lace doilies! From Allyson Baker Design. 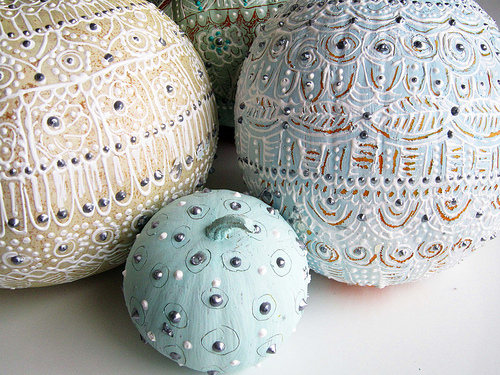 These pumpkins are a little more intricate, painted with dimensional paint. 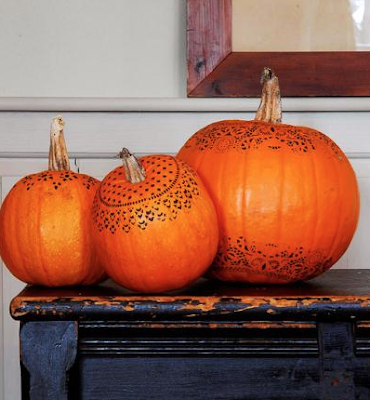 If you're wanting something simpler, the small dotted pumpkin at the bottom of the photo is a great way to start–the dots could work on a larger pumpkin, too. From Alisa Burke. 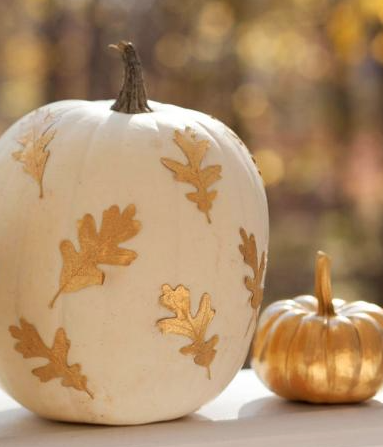 Decorated with leaves: 1) An elegant look–decorate a white pumpkin with gold leaves–using spray-painted real or artificial leaves. 2) Use leaf-shaped stencils to decorate pumpkins. From Midwest Living. 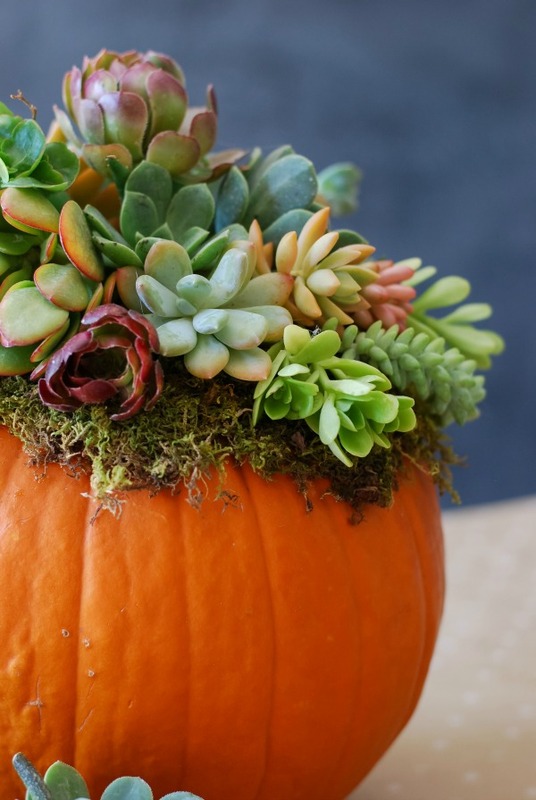 Who would have thought succulent cuttings would look so nice arranged with moss on a pumpkin? Find instructions at Simply Happenstance. So many pretty ideas! Are you inspired to try any of these? 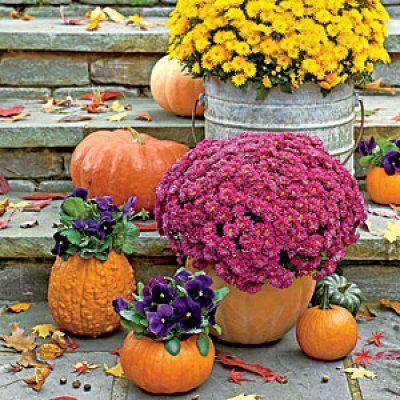 1) Use metal buckets or pumpkins as outdoor planters for a bright burst of autumn color! 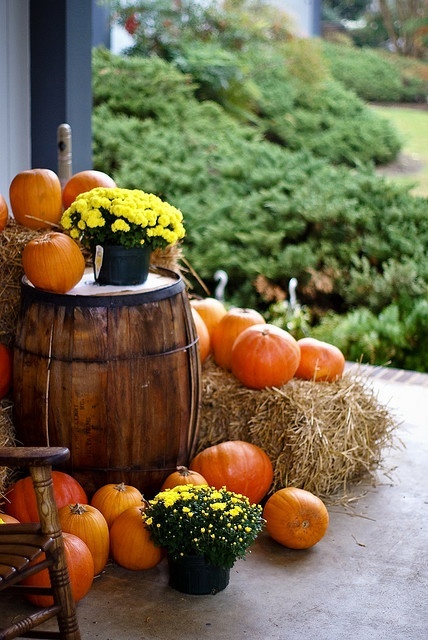 2) Add a rustic wooden barrel and hay bale to your pumpkin porch display. From It's A Beautiful World. 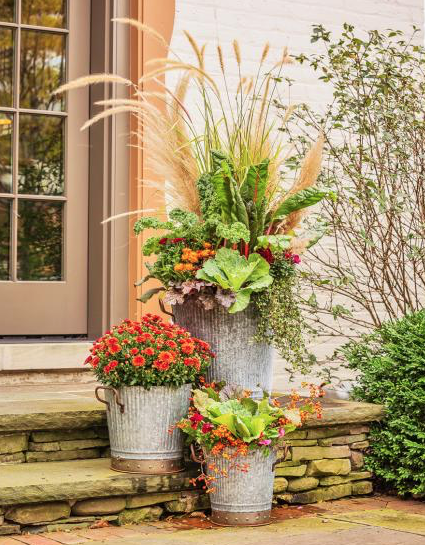 A metal bucket also makes a great large vase for all those pretty late summer/early fall flowers! From Just Believe! Make a fall garland and hang from your mantel or a doorway for a beautiful decoration that also has the wonderful scents of dried orange slices, bay leaves, and cinnamon sticks. See instructions at Garden Matter. 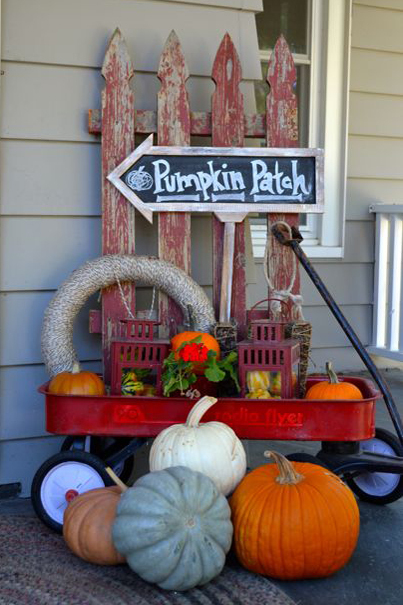 Use a red wagon as part of your autumn porch display. From Country Living. 1) Use natural elements like pumpkins, stones, moss, and leaves to make centerpieces for your dining table, an arrangement on your coffee table, or a special display on your mantel. 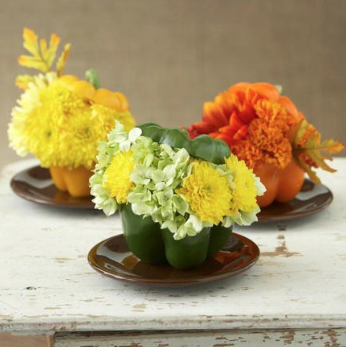 2) Use hollowed-out bell peppers as vases (you can also do this with mini-sized pumpkins). 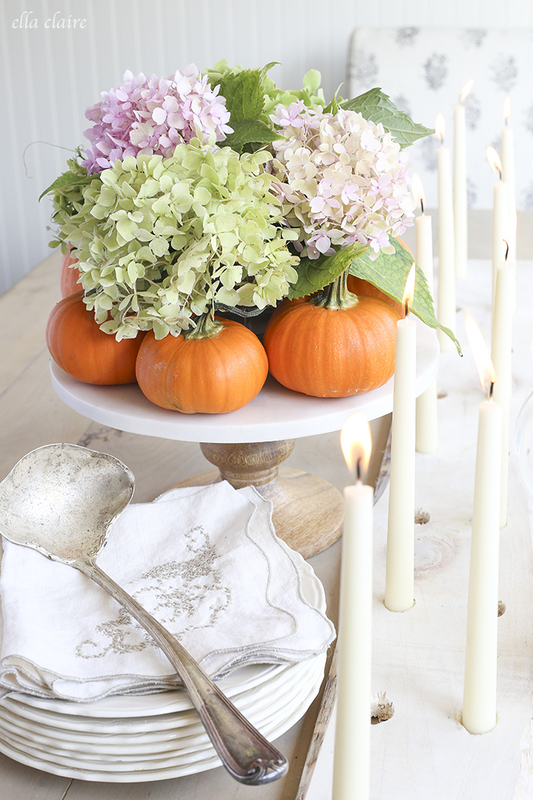 3) Or you may decide to skip the color and opt for the elegance of a white-on-white display! From Midwest Living. What special ways do you like to decorate your home for fall? I've always thought the ideal place to live, if one could afford it, would be in a seaside cottage. 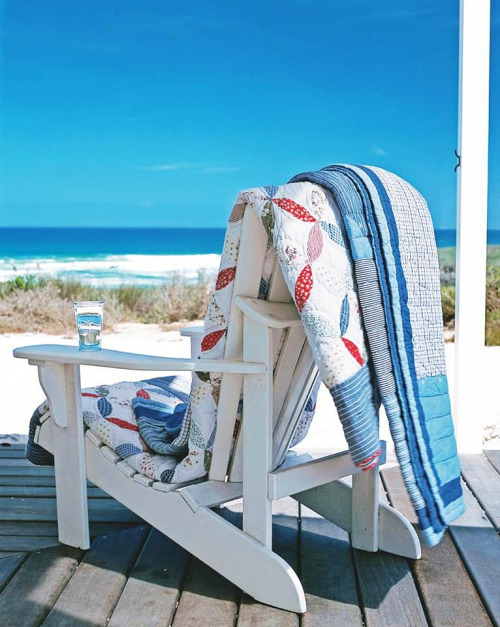 But wherever your cottage is, you can still relax on a blue-sky, sunny day in a comfortable chair and enjoy the beauty around you. Read a good book, take a relaxing nap, or soak up some sunshine...and be thankful for the beauty of this season that invites you to slow down and enjoy the simple pleasures of life. © 2012-2015 Cottage Flavor. Simple theme. Powered by Blogger.